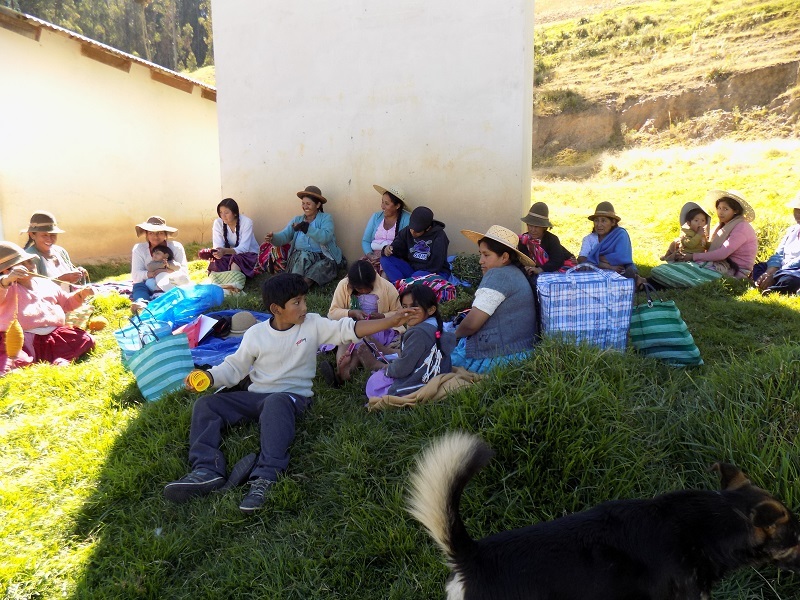 A few days ago Doña Máxima, her daughter Vilma, Vilma´s 4 children, and Dorinda packed into a contracted pickup truck for the trip to meet with the weavers of the Centro de Artesanía, Huancarani (CAH). For the first time in 2 years Vilma´s 2 daughters were dressed as their mother and grandmother in polleras and blusas of their own. 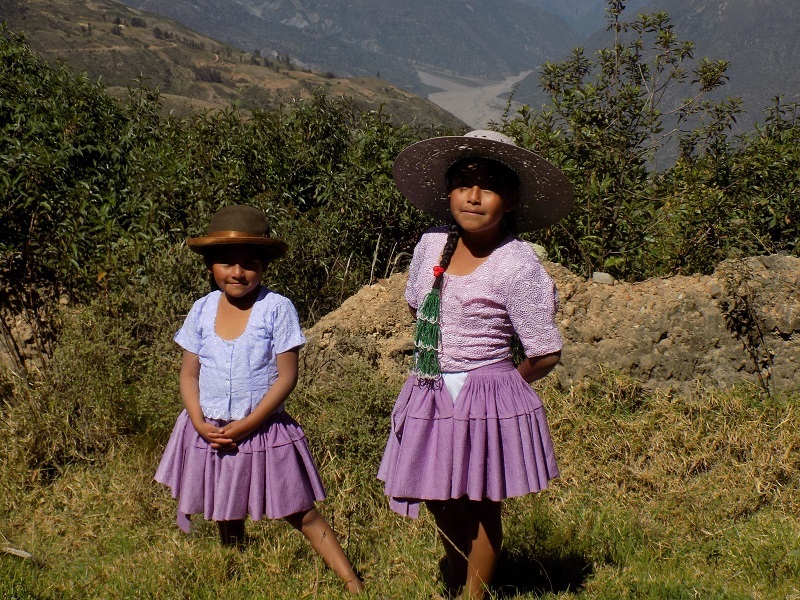 It was discovered a week before the trip that they´d long outgrown their rural wear so a sewing frenzy followed so they could be outfitted in new polleras and resized blusas for the planned photo taking session in Huancarani. 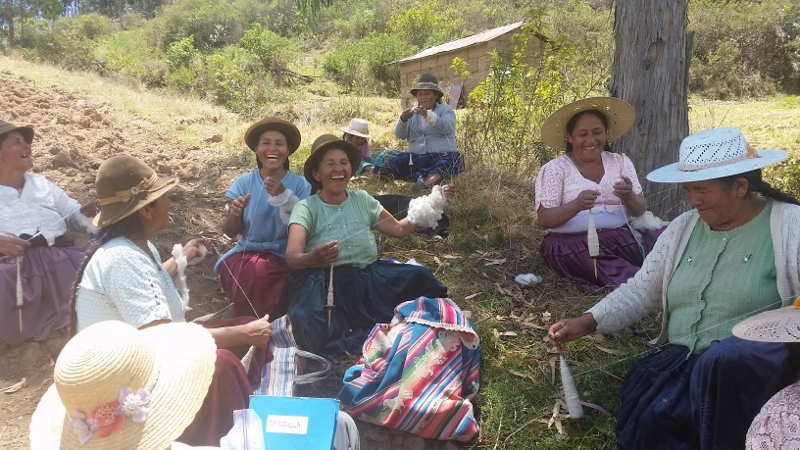 Prior to the meeting with the weavers the women and girls hopped out of the truck for the short walk to Doña Justina´s farmstead. The boys and truck headed down to the soccer field where the meeting would be held. There was an immediate sense of serenity as the dusty road was left behind and the group followed a winding footpath across the green hillside and skipped across the stepping stones in 2 small creeks. A spectacular view opened up of the wide gravel riverbed and small trickle of the Ayopaya River cutting through the steep mountains forming a natural border between the States of Cochabamba and La Paz. Doña Justina greeted her visitors with bowls of hot boiled corn, a rural staple, and fresh cheese. 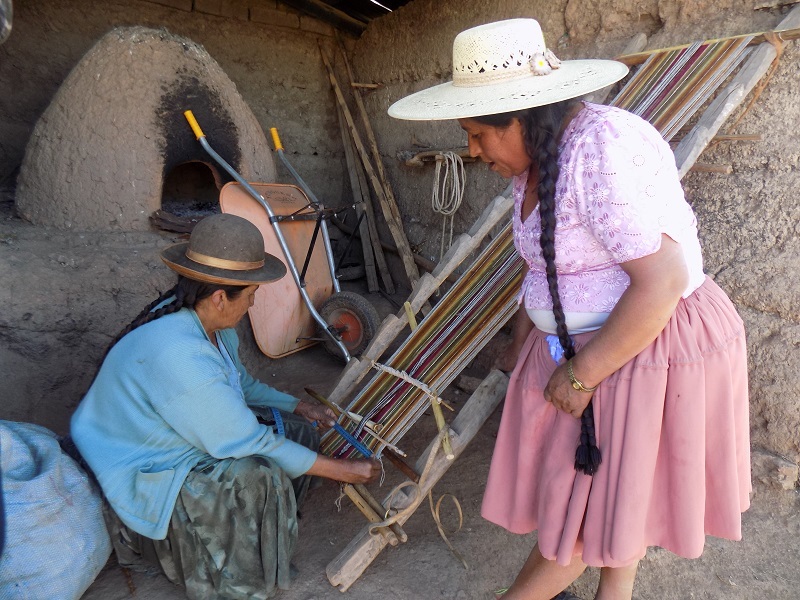 She had a finished weaving for an order that Doña Máxima measured and collected. 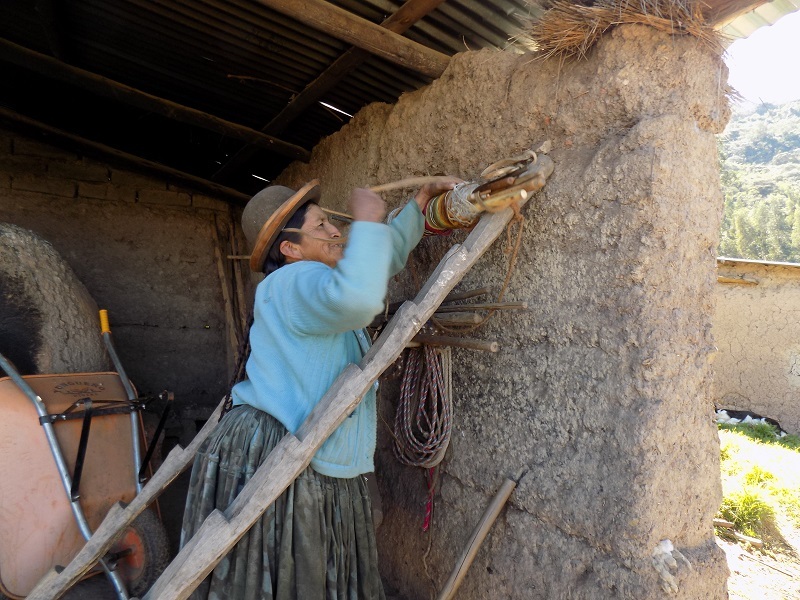 Although Doña Justina´s leaning frame loom appeared empty, she had a work in progress rolled up and secured at the top of the loom. She unrolled it to consult Doña Máxima about the specifications. While they talked about the weaving, Vilma had her daughters wet their heads under a water spigot so their hair could be braided and adorned with “tullmas”, beaded loops that add about 8” of length. Doña Justina´s youngest daughter, Miriam, was coerced into donning a pollera and blusa for the day. While she changed there was a short meeting about the upcoming Tinkuy International Weaving Conference. It will be Doña Máxima´s 3rd Tinkuy and the 1st for Doña Justina. She has been the President of the CAH for 3 years and was invited by PAZA to participate in the Tinkuy because she has proven her interest and commitment to leadership through the organization of CAH and Spinzilla activities in Huancarani. 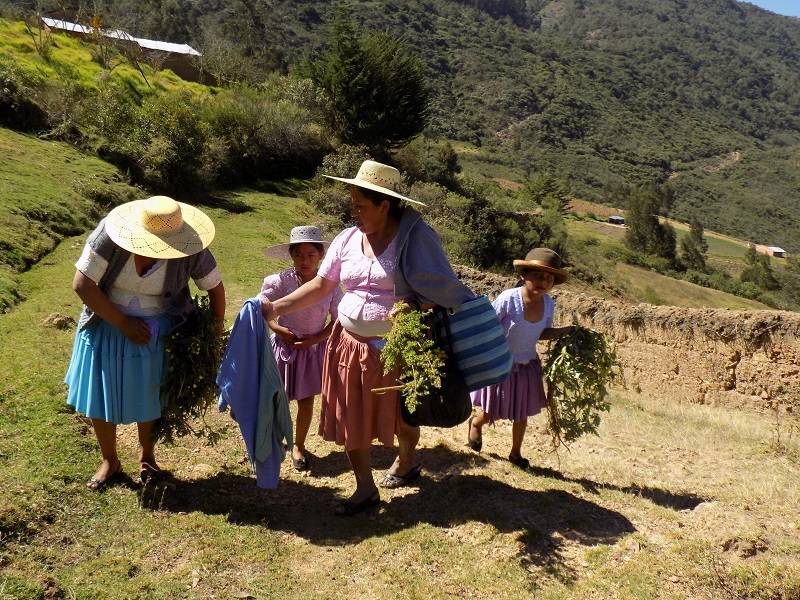 On the walk back to the road Doña Máxima and Vilma collected 4 varieties of medicinal plants. 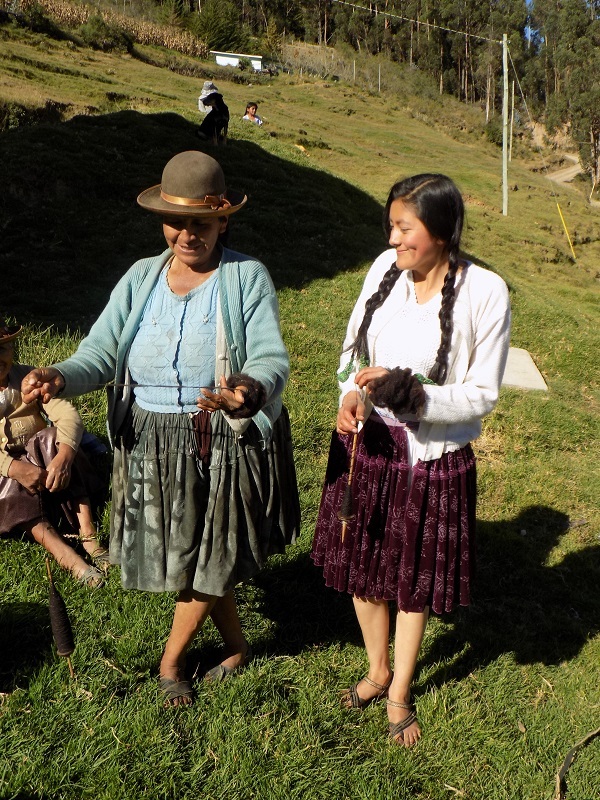 Vilma used her sweater as a makeshift aguayo which enabled her to carry the plants on her back. A few weavers were chatting and spinning in the shade of the church which sits alongside the soccer field, and more drifted in until there was more than a quorum of the 28 members to have an official CAH meeting. The topics of the day were Spinzilla Spinning Week in October and Doña Máxima´s presentation at the Tinkuy in November. Many of the weavers have expressed interest in attending the Tinkuy, but most would have found the logistics of leaving their farm and livestock for a week impossible. Doña Máxima and Doña Justina will be representing all of them and so PAZA has tasked them all with sharing their weaving history so that Doña Máxima´s presentation is representative of everyone. The meeting was the starting point for what the weavers want to share with a bigger weaving world about their weaving tradition. Photos are needed in a PowerPoint to accompany the presentation. That is a challenge because there are no historical photos of the weavers as girls or teens. Cameras were rare until the recent arrival of cheap cell phones with cameras. The meeting in Huancarani was scheduled for the school vacation so that kids would be available for the photo session. 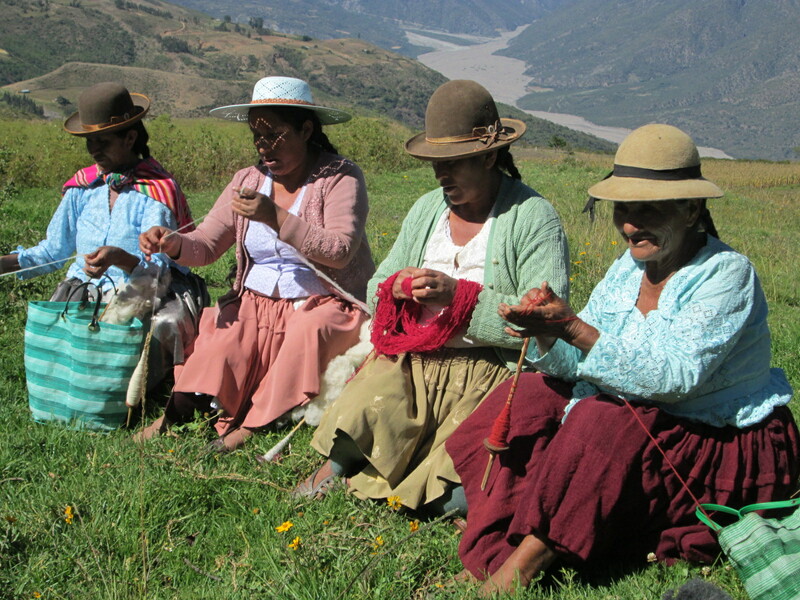 Doña Maxima´s granddaughters had their first weaving classes the week prior during the Club de Artesanas (CdA) meetings. 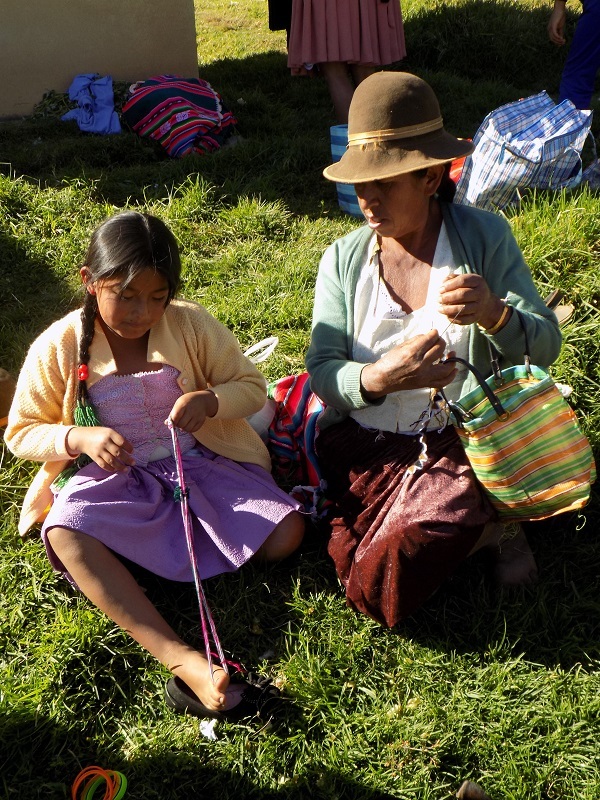 Nine year old Wendy sat through the meeting working on weaving a strap with figures she´d learned. Her mother Vilma kept an eye on her progress and after the meeting her great-aunt Narciza worked with her. Doña Narciza is Doña Maxima´s older sister by 7 years, and during the meeting she told the group how she learned to weave. As a girl she was intrigued by the woven figures and learned on her own from others. 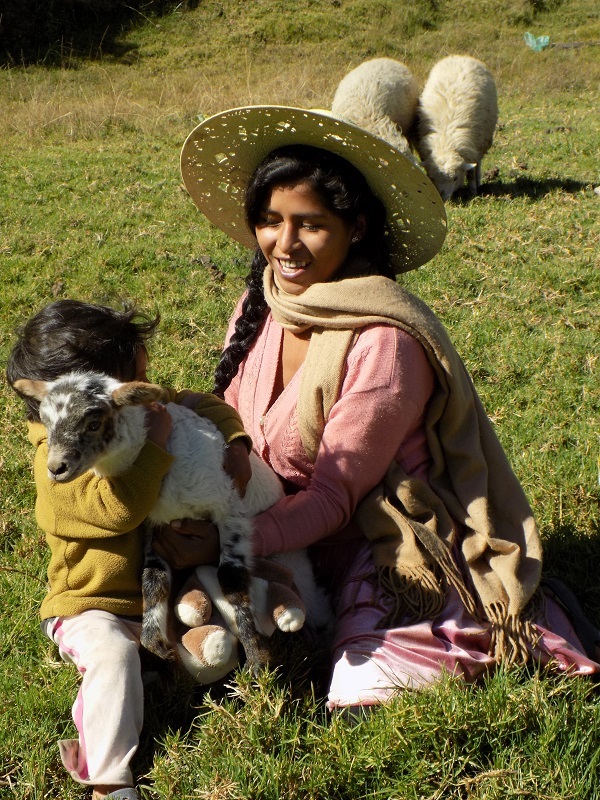 While she pastured the family´s flock she would seek out friends who knew how to weave various motifs. She also befriended an “abuelita” (elderly woman) who taught her. It was Doña Narciza who taught their mother how to weave the figures. Years later Doña Máxima learned how to weave from her mother, not wanting instruction from her impatient older sister. It was at this meeting that Doña Máxima learned that their grandmother did not know how to weave figures and that their mother learned as an adult from her teenage daughter Narciza. The “learning to weave” stories seem to have been deeply buried, so more tales will be collected when the weavers drop by the PAZA workshop on Sundays. Although the girls were dressed up for the day their actions didn´t need to be staged. 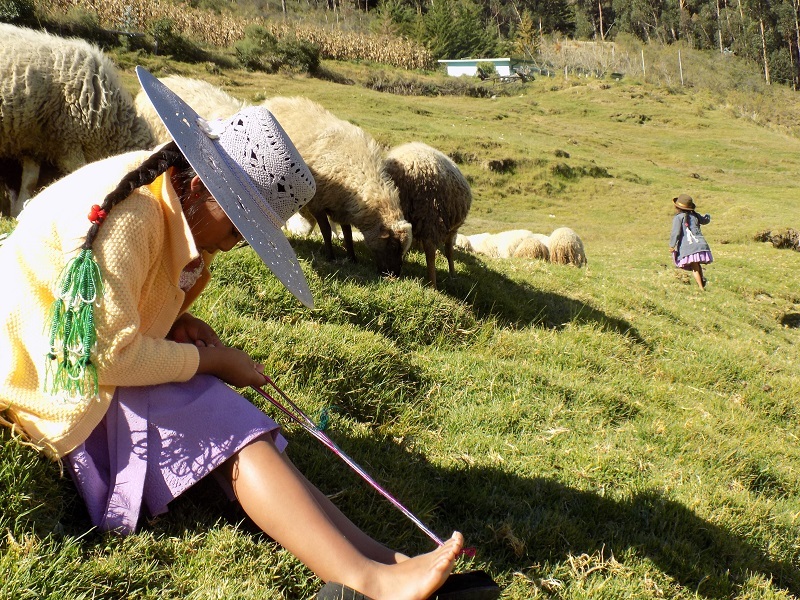 Seven year old Emily and the boys took it upon themselves to keep Doña Toribia´s flock in line, which involved a lot of running up and down the hillside in sheer exuberance of being outside in the country on a sunny day. It´s definitely not the shepherding technique of the weavers who walk and spin, but it would be the shepherding method of children heralding back eons. It was a fun and memorable day, and may the stories that were shared be remembered by the young ones in attendance. It is with heartfelt gratitude to Dorinda´s college friend Douglas and his family´s P.J. Broderick Memorial Foundation that the Tinkuy expenses for the 3 PAZA participants have been covered. Thank you so much!